Beauty surrounds us everywhere, whether or not we are conscious of its presence. It awaits our attention and, at the best of moments, it fully absorbs us. An infectious smile, the dappled texture of light on forest leaves, the crunch of steps on snow – all of these move around and through us, creating new relationships between the object and its observers. Beauty Waits reframes these moments as an immersive cinematographic experience, a journey of disorientation and reorientation that reawakens emotional connections. Using the latest cinematic tools including aerial drones and advanced motion capture technologies, it presents a series of shifting sensory environments to attune our senses to the beauty around and within us. This installation is a journey that explores the power of beauty to summon new contemplative experiences. An infectious smile, the dappled texture of light on forest leaves, the crunch of steps on snow – all of these move around and through us, creating new relationships between the object and its observers. Beauty Waits reframes these moments as an immersive cinematographic experience that reorients our senses and alerts us to a mix of perspectives outside our everyday reality. Using the latest cinematic tools including aerial drones and advanced motion capture technologies, it presents a series of shifting sensory environments to create new forms of subjectivity. A composition that unfolds as a multimedia walking tour, the installation heightens, extends and encompasses our awareness of the gifts that hide in plain sight. In early western philosophy, the Pythagorean school saw beauty in the symmetrical proportions of the golden ratio. For Plato, beauty was a range of ideal forms toward which art could only strive. For Aristotle, virtue itself was in the service of beauty, arguing that “virtue aims at the beautiful”. And in traditional Japanese aesthetics, wabi-sabi recognized beauty as a form of imperfection and impermanence. Beauty waits for no one and everyone. It comes in momentary sparks and waves, entering our perception and then disappearing from view. The beauty of the bird, the flower and the sunset become all the more valuable in their transience. Fortunately for us, beauty is patient, at times even timid, and can be voracious when we answer its call. By capturing and delivering multiple, simultaneous perspectives — macro to micro, terrestrial to aerial, fixed and in motion — the installation reveals various forms of beauty by expanding the human sensory experience. Why make a piece about beauty? Today, our collective attention is consumed by the dark side of humankind. Our sense of time and our relationships to nature are stretched to the breaking point by the unknown outcomes of environmental destruction, only to collapse again into fleeting technological thrills. We speak often of preserving our natural connections, yet we forget what it is we hope to preserve. Beauty Waits brings these connections to the forefront and attunes our senses to the beauty around and within us. 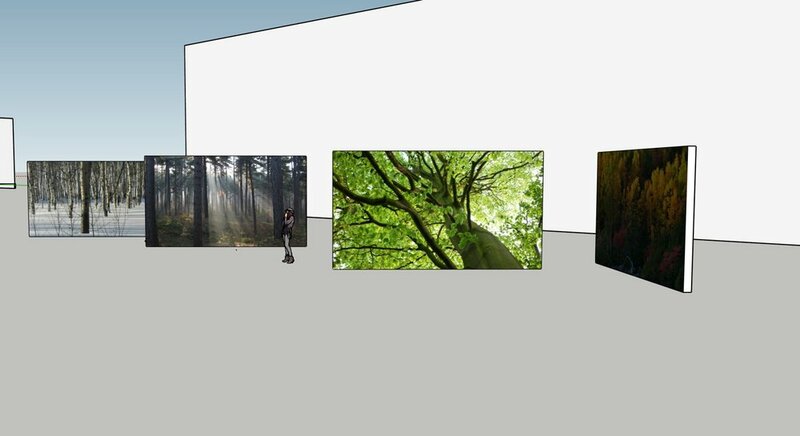 A 12-channel video installation projected on large screens 16x9 approximately 3 meters in height. 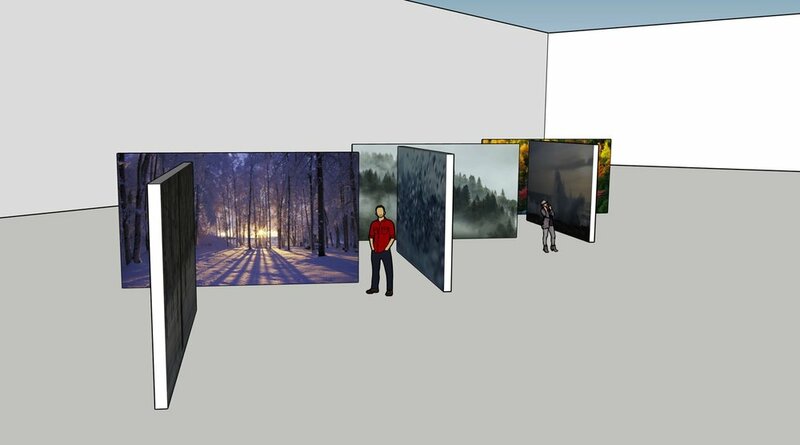 As the illustration shows, the screens would be perpendicular to one another and in a line, providing a maze-like experience that the viewer can wander through, i.e., "a walk in the woods." The content will move through a series of places and emotional experiences. Estimated running time: 60 minutes.